Will Blockchain Technology Replace Cash? If Europe is heading toward a cashless society, the loss of freedom will follow. 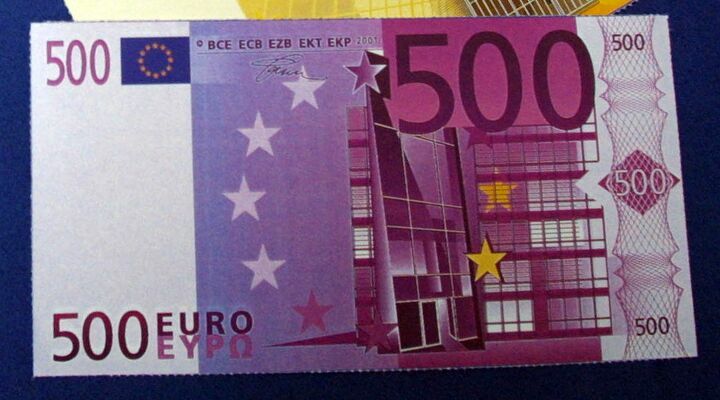 The European Central Bank (ecb) decided on May 4 to withdraw the €500 banknote from circulation by the end of 2018. The stated reason is that the bill is often used for illicit cash transactions. Although most supporters of this policy say they don’t want to totally abolish cash, some economic analysts believe a cashless monetary system will be the next step, leading to the loss of many freedoms. The German government also plans to limit all cash transactions to less than €5,000, saying that terrorism is often sponsored by high-cash transactions. The March terrorist attacks in Brussels, Belgium, gave these advocates a significant push forward. Even after banning the €500 note, millions of euros could still be carried in a small handbag. Nobert Haring, a German economist and business journalist, explained in an interview with N-tv that terrorists would not be bothered by the planned limit on cash transactions. He said a total ban of cash would be required to have an effect on terrorists. But economists fear that a cashless society will give authorities unprecedented control over their citizens. Spiegel columnist Sascha Lobo wrote on February 3, “The ban on cash payments over €5,000 could be just the first step. Finally, the abolition of physical cash offers fantastic new surveillance capabilities” (Trumpet translation throughout). In a cashless society, the government could electronically track and control ongoing transactions. The political will to enforce a restriction seems to be present—even if this goes against the will of the population. If at one point €50 or €20 bills, or something similar, are the biggest bills in Europe, then cash would be already so far marginalized that an abolition would no longer be a worry. In this very gradual way of making the bills smaller and portraying cash more and more as something indecent, it can also be achieved against the will of the population. If this works, major consequences for our privacy and our freedom would follow. That would lead the way into total control. Interestingly, the German Bundesbank does not support this “war on cash” movement. However, many forces are working against the Bundesbank. The Financial Technology (Fintech) sector works on cashless transfers. Investors in Fintech have been trying, unsuccessfully, to raise awareness of more efficient banking technologies. A government-enforced abolition of cash would be a boom to the industry. One of the greatest supporters and advisers for these banking technology start-ups is former German economic minister Karl-Theodor zu Guttenberg. Through his adviser company, Spitzberg Partners, Guttenberg invests in the Fintech scene in Switzerland and promotes a change in the current banking system. Last April, he joined the board of directors for Mountain Partners, a prominent Swiss investment company specializing in technology start-ups. Guttenberg believes Europe is sleeping through the digitalization. At the Finance 2.0 conference in Zurich, Switzerland, attendees discussed the future of digital banking. Guttenberg said: “Today we have a customer base of ‘millennials,’ which grew up under a different star than the older generation.” Customers demand more flexible banking, and Guttenberg believes that blockchain is very important in this regard. [W]e are speaking about a blockchain technology that can safely and inexpensively manage decentralized databases worldwide—without parent supervision. As inconsequential as this may sound, it is a revolutionary idea in the field of information technology.A digital bank statement for transactions between computers is created. Every conceivable variation is recognized block-by-block (hence the name) and finally stored, decentralized and distributed to many computers: all-inclusive and for a long term. The information is transparent, hardly able to be manipulated, but verified. …[O]nce the digital information is verifiable; there is no need any more for a central facility with high-paid administrators.That’s why blockchain enthusiasm is rather limited among classic and modern “intermediaries”. Why is there a need for a correspondent bank or PayPal to vouch the legitimacy of a transaction, if the authenticity of the information can be recognized and ensured without these (even faster and cheaper)? …However, the potential scope of the blockchain is much wider. The imagination knows no bounds. From contracting one’s will or land, patent directories to traffic light systems, personnel records and operations in the “Internet of Things”—even Fifa’s [soccer administration] scandals could suddenly become history. Suppose in a few years, because of your midlife crisis, you buy a wickedly expensive sports car from a slick car dealer, and you pay it in installments. However, your divorce is expensive and you cannot manage the third installment. Nonetheless, you want to cruise though Italy in summer; maybe [you want to] even stay there until your dealer or his lawyer notices that you are already over the hill—quite some time could pass [without notice] in the present year of 2015. The following could never happen with the blockchain technology: When you want to break up, your sports car remains closed. Here, not a classic contract (which can be easily bypassed) or a third party, but a digital “Smart Contract” prevents you from breaking the contract. The individual constituent parts are ensured self-sufficiently and digitally: triggering the installment payment, but also the digital closing of the sports car in the event of default. Using blockchain technology, if a person misses a payment, he could be electronically locked out of his car; he also could find himself locked out of his new apartment; even his electricity or water supply could be automatically denied as soon as he stopped paying his bills. If his smartphone, laptop or tv is based on such a “Smart Contract,” it could be blocked as well. Citizens who refuse to pay taxes could be excluded from all public services, supposedly preventing anyone from cheating the system. If cash is eliminated, people who do not have access to blockchain technology will be unable to be involved in any form of trade. In this new system, one can’t even exchange things on a larger scale because all evidence that he or she is the owner of a house, car or anything is digital. Edward Budd, chief digital officer of Deutsche Bank, said that this technology could be implemented on a large scale in three to five years. Consider the danger in this new system—the potential control the government would have over its citizens. Blockchain is supposed to be free from control by outside forces—only the individuals are involved. However, that is only true to a certain extent. The nature of the blockchain technology is that it leaves a digital record, an electronic fingerprint. Governments could piggyback this technology, creating a massive surveillance state. In the age of supercomputing and the nsa, is this really so far-fetched? Everyone wants to be able to “buy or sell.” In this scriptural usage, the expression “buy or sell” more literally indicates being able to buy—not that stores or those from whom one might make purchases of the necessities of life would refuse to accept the money, but that the one refusing the “mark” would not be able to buy, would not be able to earn a living, to earn a wage or salary, or to engage himself in business. Those who want to participate in any form of commerce will have to take on the “mark of the beast,” meaning everyone will be forced to keep the government’s laws. Mr. Armstrong explained, the mark of the beast is Sunday worship. Sunday-keeping is already an established law in a few European countries. Catholic Bishops have been trying for years to establish it across Europe. This, in particular, becomes very important when a six-day work week is introduced, as it was once planned in Greece. Through this new technology, the government could easily enforce such a law and make sure it is being kept. If someone is found not keeping Sunday worship but rather having trade records on this day, he could be denied access to the technology. In the same way, if someone is found to be not working on another day when he is supposed to work, he too could be denied access. Guttenberg said that Europe should be the one leading in this digitization. The book of Revelation also speaks about an economic superpower rising in Europe. This superpower will force the world to take on the mark of the beast. The blockchain technology could offer the means to fulfill that prophecy.